(Phys.org)—Despite evidence that phenotypic change does not always occur uniformly across all species members and lineages, single size or shape traits are often used to represent species-level change in its entirety. Recently, however, scientists in the Department of Geology at the Field Museum of Natural History in Chicago and at the Museum für Naturkunde in Berlin asked a deceptively simple question – Are (or when are) single traits adequate representations of species-level change? – and answered it by asking another: How often do single traits show conflicting patterns in the same sequence? To answer the second, they examined trait variation frequency in fossils, finding that within most lineages, evolutionary mode (the pattern of evolution, as opposed to its rate) does indeed vary across traits – and the probability of these patterns conflicting within a given lineage patterns increases in proportion to the number of traits analyzed. Moreover, the evolution of single traits may vary despite a particular mode being dominant. The researchers suggest that their findings provide evidence that widespread mosaic evolution – the tendency for different parts within species to evolve in different ways or at different rates – has occurred throughout our planet's history. Postdoctoral researcher Melanie J. Hopkins (Museum für Naturkunde) and Associate Curator Scott Lidgard (Field Museum of Natural History) encountered a range of challenges when conducting their investigation. "The main challenge in testing the validity of this assumption that single phenotypic traits are adequate representations of species-level change is that, due to time and computational constraints, researchers are limited in just how much they can measure when describing an organism," Hopkins tells Phys.org. "Therefore, it's essentially impossible to know all aspects of change within a species through time – making it very difficult to test the assumption that a single trait, or even several traits, adequately represents change across the species." When it came to tallying the frequency with which traits vary in evolutionary mode within fossil species lineages, Hopkins adds, the main challenge here was twofold: tabulating the data in a form that could be consistently analyzed; and determining if the dataset or methods used biased the results in any way. The researchers addressed these challenges through a series of insights, innovations and techniques. "In reading previous work," Hopkins notes, "we realized that traits were often analyzed separately – even in the same study – and that the traits did not always show the same mode of evolution. This implied that our understanding of the evolution of species might depend critically on what traits we were looking at." Once having this insight, the scientists wanted to know how widespread this conflict was across different groups of organisms and through time. They then decided to undertake a systematic review of all of the traits that had been measured in the fossil record to date. "Past studies on within-lineage trends in the fossil record were conducted at different levels of spatial and temporal resolution and using different methods of analysis," Hopkins continues. "As a result, it has been difficult to synthesize findings without simply relying on the particular interpretation on any given study. Instead, we analyzed the original data from as many studies as we could find using a consistent analytical protocol – in this case, the model-selection based method developed in 2006 and 2007 by Gene Hunt at the Smithsonian." The model-selection technique is very powerful because it gave the scientists a way to compare numerous studies in a consistent and rigorous way. One of the study's findings was that within the majority of lineages, evolutionary mode varies across traits and the likelihood of conflicting within-lineage patterns increases with the number of traits analyzed. 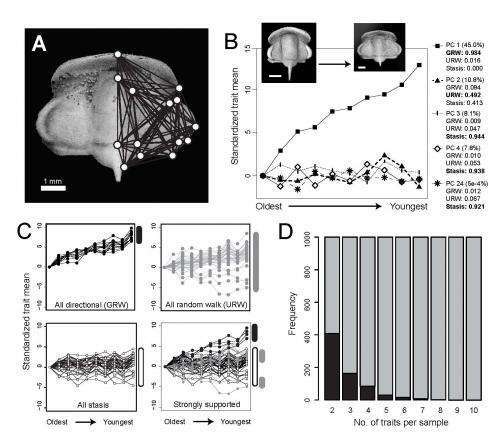 "Some traits show directional change – for example, an increase in tooth size over time – while others traits change randomly, show little change or stasis, Hopkins explains. "However, traits do not always show the same patterns of change – they frequently do not change in a coordinated fashion, even within the same lineage. Therefore, the more traits researchers measure from a single lineage, the more likely they are to see conflict in patterns of change amongst traits." Another important result was that single traits may show variation in evolutionary mode even in situations where the overall morphological evolution of the lineage is dominated by one type of mode. "Sometimes evolutionary change within a species is dominated by a particular mode of evolution – for example, overall, a species may stay relatively the same in size and shape through time," says Hopkins. "However, there are often situations where a few traits change even though the rest do not." Perhaps the study's key finding is that its results validate the idea that morphological patterns of mosaic evolution are pervasive across groups of organisms throughout Earth's history. ".Our results show that the frequency for different parts within species to evolve in different ways is high. Because this dataset included representatives from all different types of organisms that were sampled throughout the last 500 million years of the fossil record, including mammals, fish, mollusks, and single-celled marine plankton, our results imply that mosaic evolution is ubiquitous." Moving forward, Hopkins concludes, "We're currently looking in more detail at data collection methods and expanding our inquiry to include additional and more complicated models of evolution." maybe this explains the utter purposelessness of genetic studies that try to nail down the specific changes of genes that lead to complex multigenic aspects of humanity such as sexuality or intelligence. even if they find something with promise in a small population of people, there could be other changes in the general population that are accounting for various observed changes in the nebulous observed behavioral l concepts we understand as 'phenotypes' such as sexuality and intelligence, -=----phenotypys far more complex than say --height or eye color. Phenotypes are far more complex than you understand them to be. Putting it simply, individual cell types have phenotypes, mRNA have phenotypes (alternate splicing), organs have phenotypes, etc, etc. External stimuli change the phenotype of a cell like that of liver cells after alcohol consumption or cultured cells after trypsinization. Gene expression is changed and therefore cell function and phenotype may change, e.g. differentiation of the common lymphoid progenitor into B-cells. I don't know if at one point in time phenotype was specifically only related to the visible traits of an organism but currently that would not be correct. My immediate reflection is on the mosaic evolution in some of Hominidae, especially hominins. Australopithecines were crazy assemblages of traits. @"...expanding our inquiry to include additional and more complicated models of evolution." The most complicated model of evolution is one where the epigenetic effects of nutrient chemicals and pheromone-controlled reproduction are detailed from the bottom-up level -- via examination of the microRNA / messenger RNA balance that is required for cell level and organism level homeostasis -- to the top-down epigenetic effects of food and pheromones on genes and behavior. Fortunately, the most complicated model is also the most obvious model of adaptive evolution via ecological, social, neurogenic, and socio-cognitive niche construction that details how "Olfaction and odor receptors provide a clear evolutionary trail that can be followed from unicellular organisms to insects to humans." http://dx.doi.org...i0.17338 Unfortunately, this model may be too complicated for most people to grasp in its entirety despite its accurate representations of cause and effect across species.